After a rainy weekend in Destin, FL and an exhausting work week. Ken and I were glad to see perfect weather for sailing on Labor Day. The wind was at about 10 knots and the humidity was low, which is a real treat here in Louisiana. 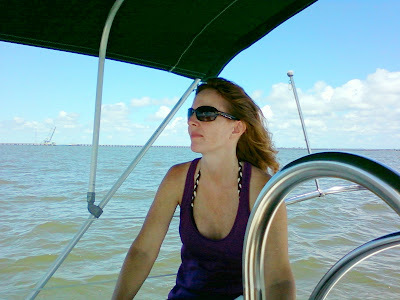 We were up and out early yesterday and sailed for several hours. 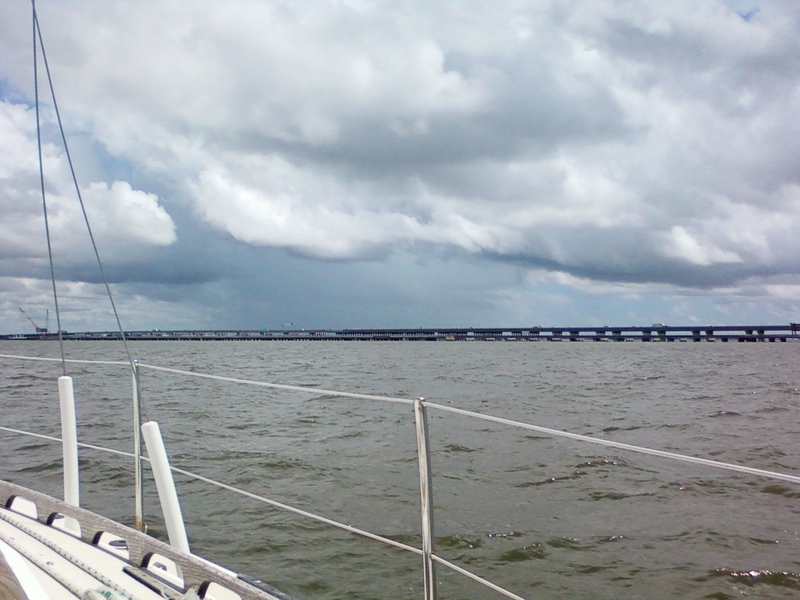 I steered a good portion of the day, and I'm really starting to get a feel for our sailboat and her reaction to the wind and my steering. 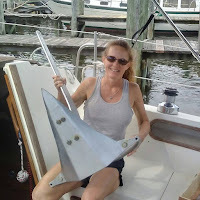 It's amazing how different a sailboat is from the motor boats we've had in the past. We now have an appreciation for what sailing is all about. 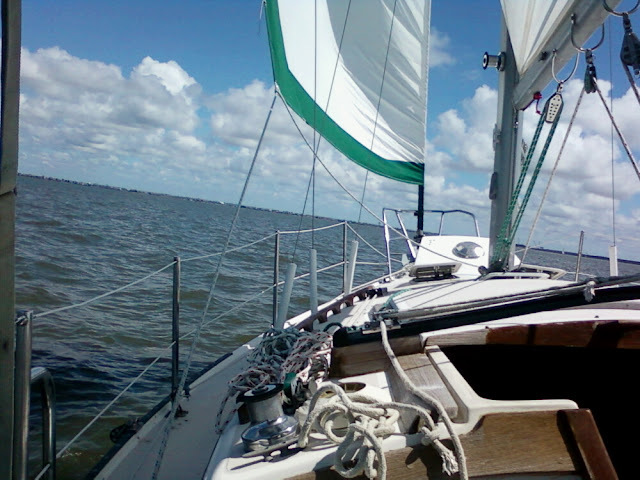 We tacked and jibed (turning around, which requires moving the sail to the opposite side of the sailboat) a few times with no problems while listening to the tunes of Jimmy Buffet and pretending that we were somewhere in the Caribbean. When posting this picture I noticed the flag pole with no flag ... I guess we need to address that soon. After a few blissful hours, the skies started turning gray and it appeared that a storm was headed our way. We needed to get back home anyway, so we pointed Nirvana into the wind and pulled in the sails. For those like us that are learning, pointing a sailboat into the wind gives much more control over the boat, as you're not fighting the wind. 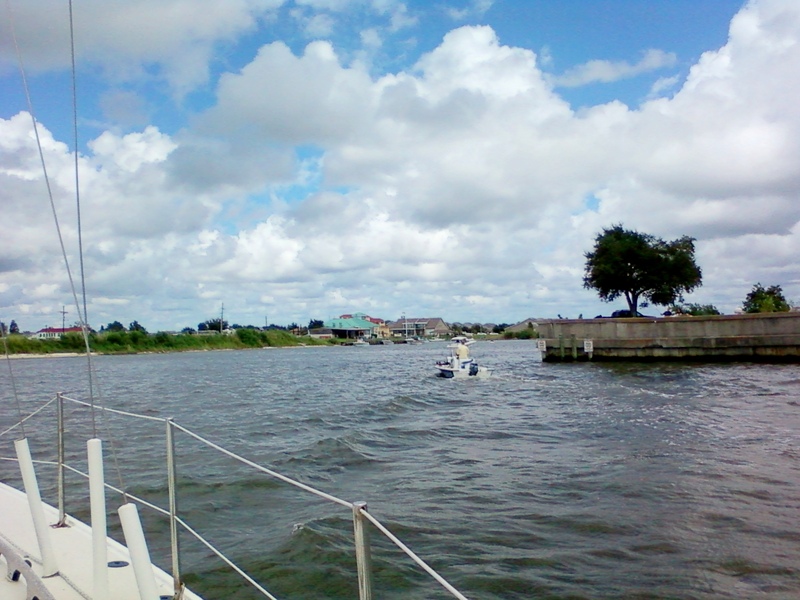 Leaving Lake Pontchartrain, we headed back towards the channel and our neighborhood. If you look close, you'll notice people on the left fishing and crabbing. 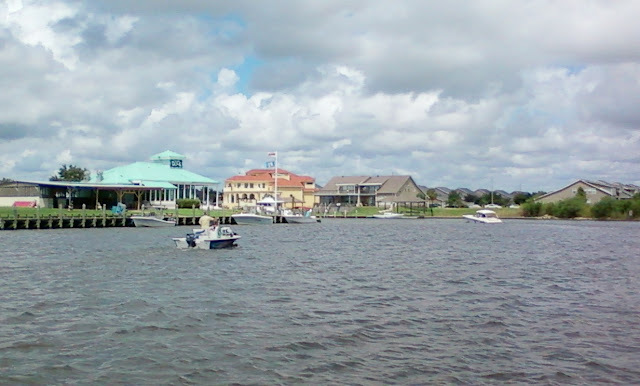 The building on the left with the green roof is "The Dock", which is a popular place to fill up on gas, food and beer with live music on Sunday afternoons. 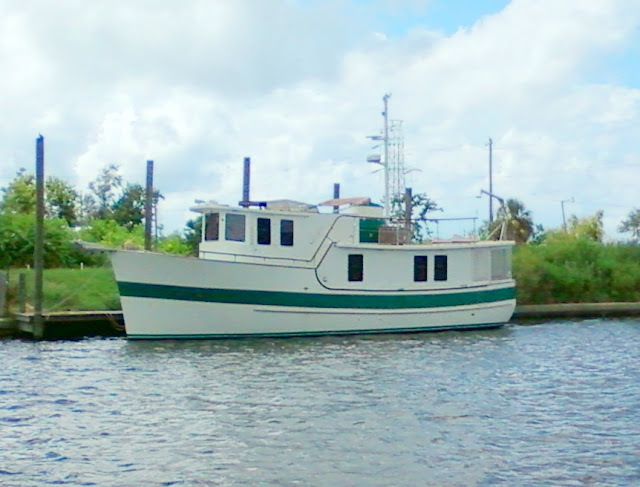 This is a boat that we really enjoy looking at whenever we are out on the water. We could easily live on this boat, but we couldn't afford to take it very far. Looks like the owners can't either. 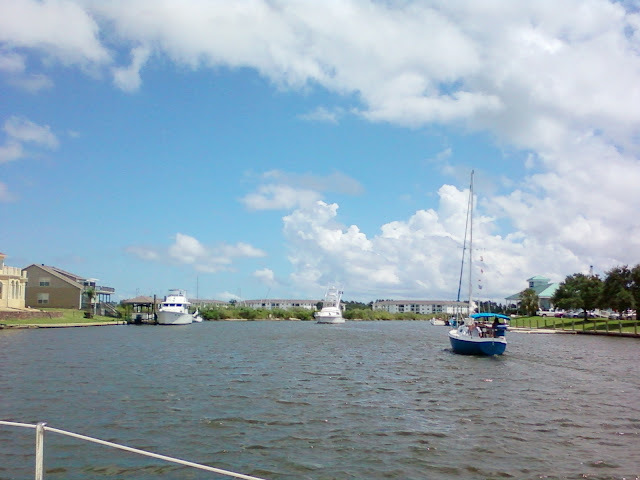 This is the other side of "The Dock", with a good friend in the blue sailboat heading towards Lake Pontchartrain. The skies are blue in this picture, and luckily the storm passed. This is the third side of "The Dock", where many people launch their boats and purchase bait. There's that black cloud again! To get to our home we go forward, between the houses. Once we were home, Ken put some ribs on the grill. (We don't have a grill on Nirvana yet, but it's on our wish list). While grilling we put on Edwin McCain's Honor Among Thieves . If you're not familiar with this artist or his music, you really need to give it a try. He's got a fantastic voice and a lot of talent! We started listening to him when he played the New Orleans Jazz Fest many years ago. Anyway, Ken was messing around in the boat while waiting on the ribs and he found something we've been looking for since we purchased Nirvana ... the missing motor to the auto-pilot! Woo hoo! The previous owners said they could not locate it, and when I removed the stack of manuals that were in the nav station, Ken found the motor way in the back. What a way to end the day of sailing ... with good tunes, good food and a good find! We're really anxious to see if we can get the auto-pilot working. Hasta luego ... until then. Mid-Life Cruising! 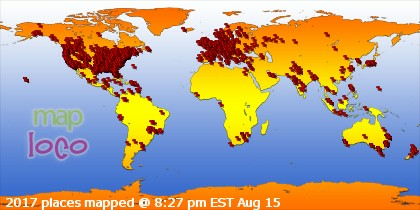 What a fun Labor Day outing. Nothing better than boating. Nothing. Great on finding the motor too. A nice bonus indeed. Wow, sounds like a great weekend!! 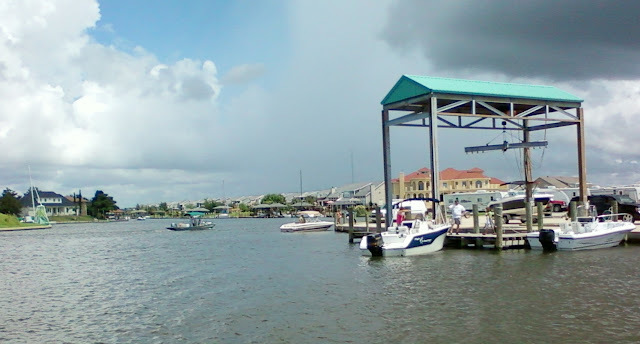 Love "the Dock" - sounds like my kind of place! Isn't it nice when good weather coincides with a Holiday weekend? And how on earth is it that things can remain hidden in such a small space like a boat? After two years we're still finding things on ours.